Domestic natural gas is helping U.S. manufacturers grow, returning some industries to America, and creating jobs at the same time. 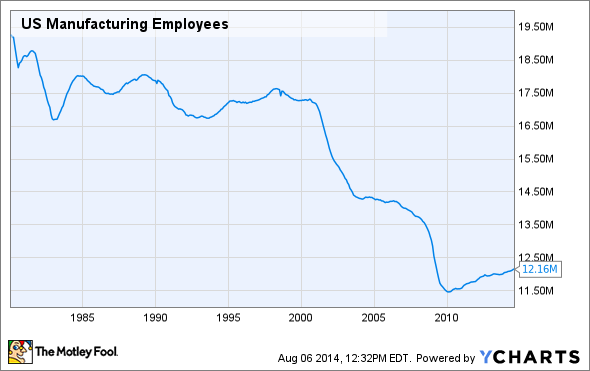 US Manufacturing Employees data by YCharts. What are 8 million manufacturing jobs worth? Based on the median American income of $50,000, that's $400 billion in lost economic value. Okay... in fairness, the economic value of those jobs today isn't the same as it was 30 years ago. As a matter of fact, many of those jobs don't exist anymore, having been lost to automation. And the ones that have been lost to overseas manufacturing -- especially in sectors like textiles and consumer electronics -- are unlikely to ever return. 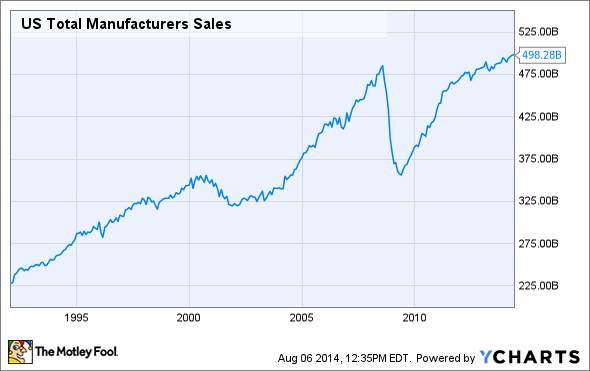 US Total Manufacturers Sales data by YCharts. It's unlikely that domestic manufacturing will ever again employ the percentages of Americans that it has in past decades, but there's a game-changing catalyst leading to even further growth in American manufacturing output. The news gets even better: It will likely be a driver of job creation, as well. During the past half decade, domestic natural gas production has rebounded strongly. Hydraulic fracturing and horizontal drilling have allowed gas and oil producers to unlock the resources trapped -- and previously considered impossible to extract -- deep inside shale rock deposits all around the country. There is plenty of controversy around these methods of production, but that's a topic for another article. Fracking has turned the United States into the "Saudi Arabia of natural gas," with more proven reserves of natural gas than the Saudis have oil. What does this mean for jobs in America? For a number of industries, inexpensive natural gas offers a significant competitive advantage that even the cheapest foreign labor can't compete with. That could lead to job creation in a handful of manufacturing sectors, as well as some powerful investment opportunities. In the aluminum industry, a large portion of their costs are energy related. The low cost of domestic natural gas has meant that even a small aluminum company like Century has moved from the fourth quartile, to the second quartile, on a global cost basis, almost exclusively on the back of cheaper natural gas prices. Laskin went on to talk about how demand for aluminum -- partly driven by higher fuel economy requirements for automobiles -- offers even further long-term potential to drive up aluminum prices domestically, even as natural gas prices keep input costs down. Steelmaker Nucor (NYSE:NUE) partnered last year with natural gas producer Encana (NYSE:ECA) in a joint venture aimed at locking in long-term cost advantages for steel production. Nucor uses natural gas to produce direct-reduced iron, or DRI, and investing in a partnership to produce natural gas gives the company a sustainable advantage versus competitors. Encana gets the benefit of a strong partner -- and customer -- that is providing funds to help cover the costs of exploration and production. The cost advantage for natural gas extends far beyond just metal goods. A number of highly valuable natural gas liquids, such as propane, butane, and ethane, are also produced with the methane that makes up natural gas. Ethane has numerous industrial uses, especially when used to produce ethylene, which is a basic ingredient in everything from soaps to fabrics (ever heard of polyester? ), and coolants to plastics. How significant is the cost advantage of domestic ethylene? By some measures, it costs as much as 80% less than ethylene in Asia. This is a benefit to companies that make everything from tires to shampoos. Dow Chemical (NYSE:DOW) is the world's largest producer of ethylene glycols, one of the most commonly used materials made from ethane. The abundance of natural gas in America is a real positive for Dow, which employs some 40% of its global workforce in the U.S., even though more than 60% of its total sales are international. During the past two years, Dow has made major commitments to U.S. manufacturing, and it plans to invest $4 billion in new American manufacturing facilities. 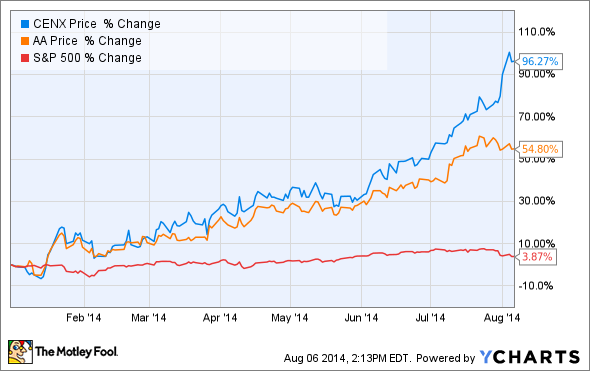 Dow Chemical isn't alone. According to the American Chemistry Council, more than $90 billion in new projects have been announced, which will have major economic impact. These projects are expected to lead to the U.S. chemical industry delivering net exports of more than $30 billion by 2018. For context, in 2005, America was a net importer, to the tune of $9 billion. That's a nearly $40 billion swing in the trade balance, almost completely tied to domestic natural gas resources. The upside of all of this new activity is, of course, jobs -- and the trickle-down effect of adding $40 billion to the domestic economy. It's estimated that a 25% increase in ethane supplies could create 400,000 manufacturing jobs alone. The question, of course, is sustainability. While it's unlikely that U.S. manufacturing will ever return to prior levels, most estimates put domestic natural gas supplies at 100 years, based on current production. In short, that leaves plenty of room to expand output, and still see a decades-long revival.